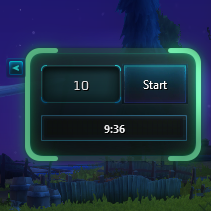 Open the window with "/simpletimer" or by clicking the icon in the Interface Menu. Then just tell it how long you want to wait and... wait! You'll get an audio alert when the countdown reaches 0. I'm using it to cook while playing (yay! \o/) and to gather my crops every 30 minutes! /st [a number]: start the timer for [a number] minutes! Added GERMAN localization (by Niklas). Completely redrawed and rewritten the UI using Jos_eu's standards (with his permission, of course). Fixed some minor issues and bugs. The timer is now saved when you /reloadui or leave the game, it restores itself automatically when you log (if it didn't reach 0 while you were offline)! This behavior can be disabled in options. Fixed a bug with saved settings. If you want to contribute directly to the project, go to the GitHub repository!